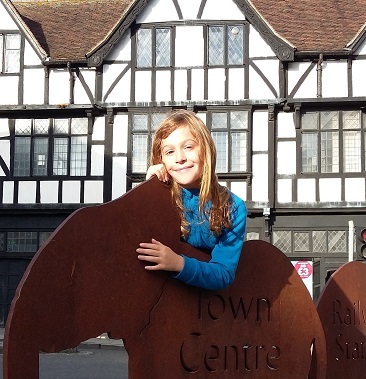 As a parent, I reckon it’s vitally important to help my children learn about managing money. Today marks the start of Financial Capability Week, so I wanted to write about different ways to approach cash with your kids. I can bang on about the importance of saving, when confronted with demands for Pokemon cards. I can try to translate the price of a Lego Death Star into weeks of pocket money (most of a lifetime, frankly). I can even attempt to bribe my offspring into doing jobs I don’t want to do, but sadly the lawn is still covered with leaves. Lectures on mortgages are never going to cut it with an eight-year-old, so I’ve stuck to the real priority: sweets. My daughter can be pretty resistant to Maths homework. However, when it comes to working out how to get the most sugar for the least money, she suddenly perks up. So goodbye healthy eating, and hello life lessons in hard cash. – downshifting brands (the pack of four own brand ice cream cones that cost loads less than Cornettos). During the October Savings Challenge, my daugher and I headed off for a freebie cinema showing. I wasn’t keen to stump up for gold-plated pick and mix in the cinema foyer, so we nipped into a corner shop to buy snacks beforehand. Now, my daugher is pretty partial to a bit* of caramel chocolate. *For a bit, subsitute “a truckload”, funds and parental guilt permitting. 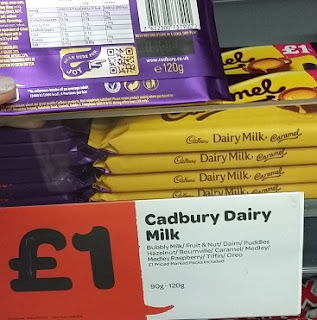 Anyway, it seemed like an ideal time to learn about money through the medium of chocolate, as we went on a mission to find the most Cadbury’s Caramel for the least cash. 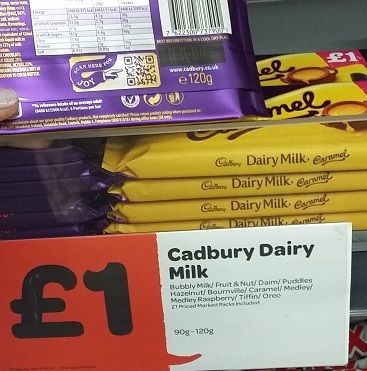 Do you have any idea how many types of Cadbury’s Caramel it is possible to buy in one small shop? First of all, my daugher spotted some Cadbury’s Heroes, which include “super cute” mini Caramel bars, apparently. I pointed out they’d have to be particularly cute when you only get 92g of chocolate for £1.69. Next we eyed up the massive bars of Cabury’s Caramel, on offer at £1 for 120g. That was definitely more chocolate for less money than the Heroes. Brand extension into biscuits. Nice. However, there were also some Cadbury’s Caramel biscuits on offer, where your £1 got you a heftier 130g. 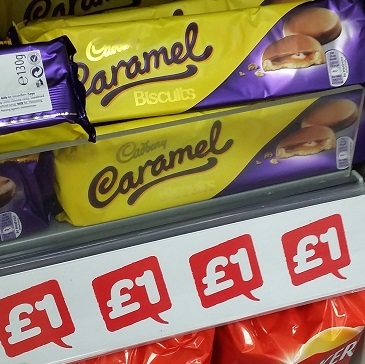 In the end though, the winner was the four pack of small Cadbury’s Caramel bars, where £1 bought 148g. I always knew that it was important to check the price per unit when food shopping. But wow, the difference based on packaging was massive when it came to Cadbury’s Caramel. 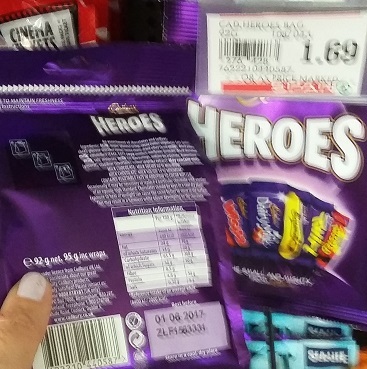 With a small bag of Cadbury’s Heroes, £1 would only stretch to 54g of sweets. 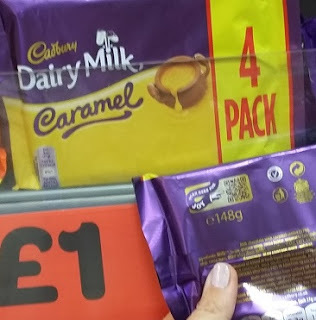 Yet a four pack of Cadbury’s Caramel on special offer meant we could get 148g of chocolate for £1 – nearly three times as much. Despite the eye-rolling in the aisles, my daughter was glad to get more choc for her money. And we enjoyed the film too. What are your top tips for helping your children make the most of their pocket money? I’d love to hear! When I went back to work after my 2nd, I had to take a Saturday job as well as my Monday to Friday (though part time) job to cover childcare. My eldest is 5, and she realised that I was actually having to take time away from her (it helps that she understands shelf stacking better as a job, project Co-ordinator doesn’t quite make for imaginative play). I explained money to her in how long it would take me to earn it- minimum wage minus tax roughly 10 minutes a £1. It’s helped us to explain why we watch every penny. Such a great idea – I’m totally stealing it. She has great taste in chocolate too BTW – caramel is one of my faves too!